Types of Car Accidents | Miami Auto Injury Lawyers Gerson & Schwartz, P.A. Contact Florida Car Accident Attorney Gerson & Schwartz, P.A. Every auto, car, and motor vehicle accident is unique and requires specialized attorneys for help. With 46 years’ experience, our personal injury law firm has represented clients in nearly every type of car accident scenario imaginable. From routine rear end collisions to more complicated cases involving multiple vehicles and complicated and catastrophic injuries such as paralysis even death. Our firm has seen it all throughout the years. Some car accidents are not as straight forward. Complicated accident scenarios with multiple collisions can make it difficult to determine who may be at fault for causing a collision. Complicated accident case facts can make it difficult for car injury victims to prove they should be compensated for the losses they incur. That’s where our expertise comes in. 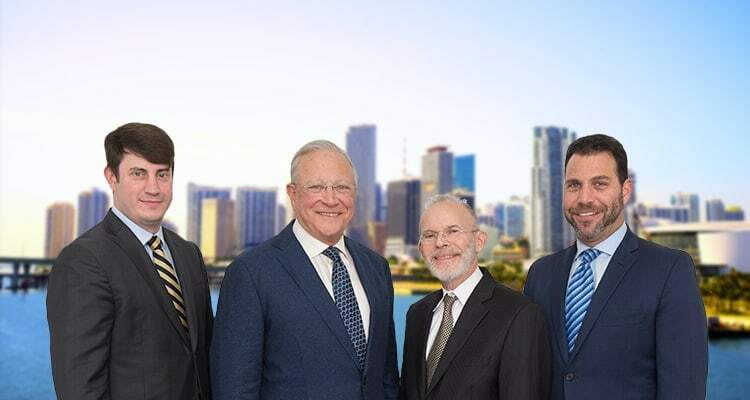 Since 1970, Miami car accident victims have trusted the Miami personal injury law offices of Gerson & Schwartz, PA to protect their legal rights. Our experienced car accident attorneys understand what it takes to prove our clients cases in the court room. Most accident lawyers in Miami will tell you that they will fight hard for the compensation you deserve. But our record of success for the last 40 years is a testament and is the proof that our law firm has the knowledge, training, and experience needed to win in court. Over 40 years of past case results shows just the type of hard work and our commitment to car accident victims in Miami. Careless Driving Accidents: Careless driving is codified in Florida Statutes Section 316.1925. Under Florida law, careless driving accidents can arise in a number of different ways. From driving to closely to another, excessively speeding over the speed limit or sudden lane changes, to failing to pay attention to your surroundings resulting in a crash. In Florida, careless driving charges is punishable by steep fines and are usually an all-encompassing moving violation that can result in suspension of your driver’s license. Over the years, Gerson and Schwartz PA car accident attorneys have represented numerous South Florida accident victims and their families for serious injury and death due to careless driving car accidents. Injuries to passengers, pedestrians, children, and wrongful death are all unfortunate harms that can result. Head-On Accidents: This type of accident occurs when one vehicle hits another vehicle going in the opposite direction. As the name implies, the heads of the two vehicles make contact with each other. Head-on collisions generate the greatest amount of force. This is because both vehicles are coming at each other with a high rate of speed and momentum, and neither is in a position to fully absorb the impact of the collision. Legal responsibility (“liability”) is simple to determine when one of the vehicles is going the wrong direction for in the lane where the collision occurred. Liability is more difficult when a lane supports two directions of traffic (such as a turning lane). In this case, the driver who entered the lane first had the right of way, and the subsequent driver will be liable for the accident. Rear End Accidents: When one vehicle collides with the back end of another vehicle, a rear end accident has occurred. Rear end accidents produce some of the easiest liability determinations of any accidents - the driver in the rear position is almost always at fault. Unless another vehicle forced the rear vehicle into the front vehicle, or unless the front vehicle backed into the stationary rear vehicle, the rear vehicle will be found to have caused the accident. Sideswipe Accidents: This type of accident occurs when one vehicle “clips” the side of another vehicle without fully colliding into it at a direct angle. There is usually less force involved in these accidents due to the off-center angle of the collision. Nonetheless, they can still cause serious injuries. In addition, a significant number of single vehicle accidents are the result of problems with the road, such as potholes, overgrown vegetation, lack of signage, shoulder drop-offs, malfunctioning stoplights, and faded lane markings. When these issues cause an accident, it may be possible to hold the government agency responsible for the maintenance and design of the road liable any losses that occurred as a result of the road defect. These claims must be brought within a relatively short period of time, however, so it is important for single-vehicle accident victims to speak to a Miami car accident lawyer as soon as they can. With over forty-six years of legal experience, the car accident lawyers of Gerson & Schwartz, P.A. have the skill and knowledge required to protect your rights after any type of auto accident. Call our office today at (877) 475-2905 to schedule your free consultation with an experienced car accident lawyer in the greater Miami area. You can also email our office through our online contact form. Our friendly staff, knowledgeable attorneys, and first-rate customer service will ease you through this difficult time.